Manufacturing defects don’t have to mean scrapping circuit boards; Corelis ScanExpress tools can help repair circuit boards by pinpointing defects at the net and pin level and even display the possible fault locations on a photograph or CAD data of the printed circuit board assembly (PCBA). Repair printed circuit board stations equipped with Corelis tools mean reduced debug time and faster recovery of faulty units during production. For additional hard-to-diagnose faults that require more additional debugging, Corelis offers intuitive tools with graphical interfaces to manually control and observe all boundary-scan signals in a system. 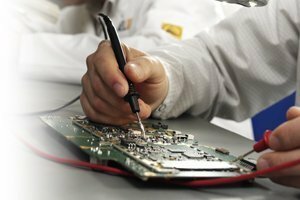 Repair technicians can use Corelis software to quickly isolate, identify, and repair faults and increase the number of deliverable products. ScanExpress Debugger – Graphically observe and control boundary-scan IO signals to isolate hard-to-find faults. ScanExpress Runner, ADO, & Viewer – Pin-point faults down to the pin and net level; possible fault locations can be overlaid on a PCBA photo or CAD file. ScanExpress JET – Take control of embedded microprocessors to identify and diagnose faults that can prevent systems from booting.